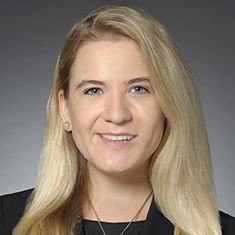 Anna Mikulski concentrates her practice in litigation matters. During law school, Anna worked in Northwestern University's Bluhm Legal Clinic Center on Wrongful Convictions. She served as membership editor for the Journal of International Law and Business and was a board member for the Women's Leadership Coalition. Anna also externed for the Honorable Mary L. Mikva of the Circuit Court of Cook County. Shown below is a selection of Anna’s engagements.